Water beads are polymers and are well known for their ability to keep floral arrangements hydrated, and for making eye-catching centerpieces. They were originally meant to add color, texture and shine to the water in a jar holding a floral arrangement. The impulse to explore, express creativity, and bring out the little scientist has led many to realize that water beads can also double as a stimulating play and learn tool for kids of all ages. Even adults find it hard not to join in the fun. Here are a few unique ideas for using water beads. For this bit of experiment, you can use a light box if you have one or make one yourself. The glass from a picture frame placed over a lamp will work just fine. Place the water beads on the light box and observe the glow. A cookie cutter or other shaping object can be used to form patterns/pictures in the beads. This can be done to create contrast by filling the cutters with different color beads. Remove the cutters once they are full and you will have a beautiful collage like result on the light box. This provides great fun for both the kids and the adults. If you soak water beads long enough, they will lose their color. They become crystal clear and will trap images inside them. 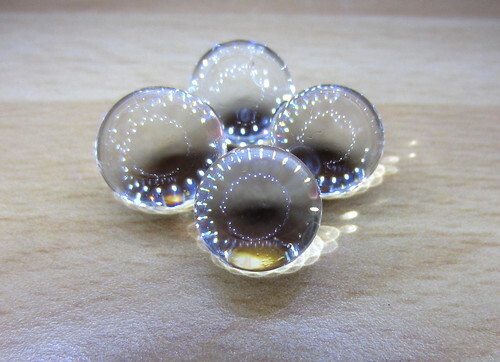 The way they reflect light and trap images make them appear like miniature crystal balls. The clear balls will become lost in water and can only be detected by touch. This makes them great for sensory play. There are varying ways of using water beads for sensory play. They can be placed in a container with water and the kids can try to separate them by color. As mentioned before, clear water beads will disappear once they hit the water. This means that the kids will only be able to locate them through the sense of touch and they usually enjoy this challenge. Adding water balls to shaving cream also makes for great sensory play. Place water beads with different color tempera paint in separate cups. Set up a little paint area such as placing a sheet of paper in the bottom of a box. Allow the child to use the water beads in whatever manner he or she chooses to add color to the paper. They may decide to dump the entire contents of a cup on the paper and form a pattern as they fall or they may decide to drop a few beads from different cups alternately. Whatever they opt to do, it will make a colorful art piece. Water beads are fun to play with and they’ll allow you to experience a surprising sense of relaxation. There are many ways you and your kids can play with these colorful beads. Each game they play will help develop their learning skills. As the weather is getting cool and leaves are fading fast, we tend to move our activities indoors. No more pool parties or fun days in the park for awhile, which can sometimes be a hassle if you’re a party planner. Children’s birthdays can get especially difficult when they must be held in the months between October and February. How many parties at Chuck E. Cheese can one person plan?! And if you can’t go outdoors and let nature do the decorating, you’re often times left with the “streamer and balloon” go-to. Ho-hum. But that doesn’t have to be the case. Crystal water beads can turn a blah cake table, decorated with crepe paper and confetti, into a wow highlight of your party. For your little princess, there’s a pink, purple, and clear water bead party mix on sale right now that would go great in a vase, surrounded by all the sparkle and frills you can stand. And our submersible water lights would add even more “bling” to her glitzy celebration. Do you have a ittle boy who is exactly that? ALL BOY? Grab some black and gold water beads for an awesome centerpiece at a Batman bash. Or you could snag our regular party mix containing blue, green, and orange beads (which is also a special item on sale right now) and turn your party place into Lego Land. And if your little ones aren’t so little anymore and have outgrown princesses and Legos, water beads can spice up their parties, too. Shabby chic is all the rage right now. So take a white and coral party mix, or even a white and teal mix and fill up some Mason jars and top it off with a twine bow. Your teen girly-girl will find out how “in” you really are! And for that tough-guy who’s too old for Super heros and cartoons, pick up the large red, black, and white party mix to match his rock-n-roll attitude. And those red, black, and white beads? Yep, also on sale! So don’t let the coming winter put the gloom on your kids’ parties. Get creative with some Crystal Water Beads and make being trapped inside a little more bearable. If you have any questions on what water beads are and how they work, contact us and maybe get on over to our site and get in on some of those great specials! Water Beads For Plants & Flowers That Are Grown From “Seed Bombs” – The Kids Will Love This! The next time you are out and about in your neighborhood with your children, have a look around at any vacant lots or neglected spaces you see. Take this time to discuss beautification of one’s environment and how we can contribute in a meaningful, but not expensive, way. One way that the kids could find some fun while planting seeds is to introduce them to “seed bombing”. You could take this opportunity to discuss the environment of your neighborhood and identify plants currently growing while also thinking about other plants or flowers that would add to the biodiversity. Tell your children about how the forest service deals with those large burn areas that are completely devoid of plant life. Explain the idea of “seed bombs”, which are an effective way of re-planting those devastated areas. Usually the “bombs” are dropped from airplanes but you could suggest that the children could hide their bombs from potential enemy spies. A successful “bombing” will occur when the seeds begin to sprout. Creating seed bombs is very easy and all you need are seeds, clay (like pottery clay) and potting soil. Combining the potting soil and the clay with some water to make everything moist but not soaked. You want to be able to form a ball shape and have it hold together. Next you will push the seeds into the mixture, use quite a few to insure successful planting. Allow for some drying (or hide the bombs while still moist) and then let your children plant the bombs in those bare and neglected patches. All you need to add is water. Springtime is the best time for seed bombing in most areas. Imagine their delight as your family walks become “missions” where you are checking to see if the bombs have “detonated”. Once you have successful growth and can even cut some flowers, you should add to the beauty of your child’s “creation” by placing them in a beautiful vase filled with water beads. These amazing and beautiful water-holding beads will add a magical touch to the vase of flowers while insuring that they are receiving sufficient water to stay fresh. If you would like to hear more ideas for family fun, or if you want to learn more about water beads please contact us and let us know. Fun ideas for kids using Crystal water beads! Need some new and creative activities for the kids? Here are a couple of ideas using amazing crystal water beads! Order water pearls in a variety of colors. Find clear containers, and various materials such as small toys/ figurines, etc. Decide on a theme, perhaps with a particular room in mind. For example, have them make a fish themed display for the bathroom. Layer various colors, such as in this example, blues and greens to give a “water” feel, inserting toy fish and perhaps shells along the sides to create an ocean scene! You can even add our Aqua scents and have it be a room freshener in disguise! Go one step further and add a submersible light for a truly intriguing display. Perhaps the kids like dinosaurs, space ships, zoo animals, flowers … whatever their interest is, they can create a unique and personalized decoration in their choice of colors…and shapes too! Water beads come in not only 2 sizes, they come in “marbles”, cubes and there are also ones that look like crystal rocks! 2) Forget the lemonade stand! Set the kids up with their own table at your next yard sale, (or even just one of those days they have an itch to make some spending money!) selling pre-made vases or candle holders filled with water beads of various colors. Pick up some inexpensive containers at your local dollar or discount store and order a good supply of water beads, keeping in mind we do have wholesale deals! Let the kids have an amazing experience in creating and selling an awesome product! Keep in mind that whatever doesn’t sell, you can have them give as gifts to friends, relatives, neighbors and teachers. Everyone will love them! Feel free to contact us with any questions, and with all of your Crystal Water Bead needs!